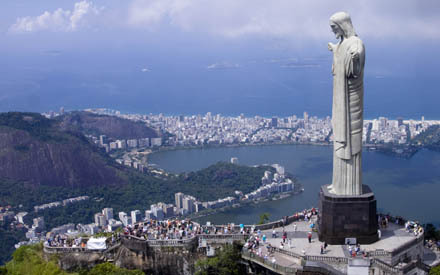 Now Rio is a fascinating and wonderful place to visit and I have been there many times, one or two of them I intend to go into in a little further in the blog. 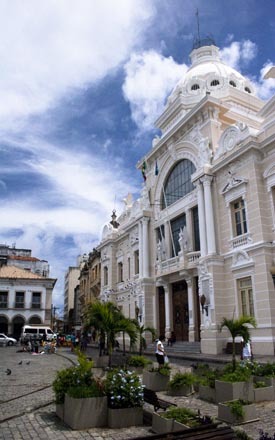 Though this time I gave my time in Rio to one of my casino staff, so that they would have a chance to experiance Rio. As cruise staff we have to sometimes do extra duties when aboard the ships, one of which is inport manning where the ship is required to keep a certain amount of people who are trained in mustering people in an emergency, to stay onboard incase there is a situation while in port. 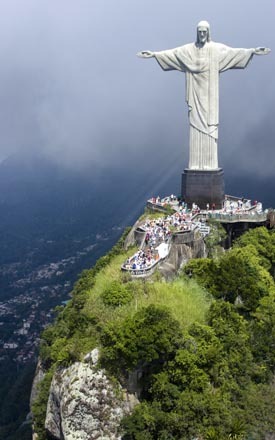 On one of the other times I had been to Rio I was lucky enough to go up to the statue of Christ, Atop Corcovado(which means ‘hunchback’) Cristo Redentor as he gazes out over Rio, a placid expression on his well-crafted face. With a group of friends we got some local currency Reals, pronounced Re-als. Then we took a few taxis to the bottom of Corcovado (Thats the name of the mountain) and after paying a small fee at the booth there, we were transferred to small busses which take you up a winding road to the base of the statue. I remember the very first time I went to the statue the taxi I was with was able to take you right up to the base of the statue. Times change and I guess we have to move along with them. We walked up the stairs passing the vendors selling small statues, magnets and heaps of other small objects of worth to somebody? just not me. Here is an excerpt from another site with a small blurb on the subject. 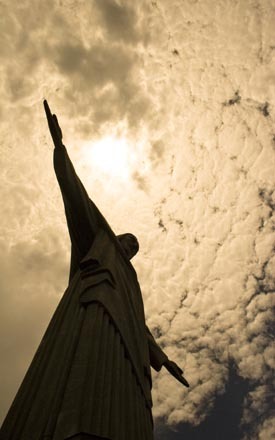 It wasn’t until 1921 that someone had the idea of placing a statue atop Corcovado. A team of French artisans headed by sculptor Paul Landowski was assigned the task of erecting a statue of Christ with his arms apart. 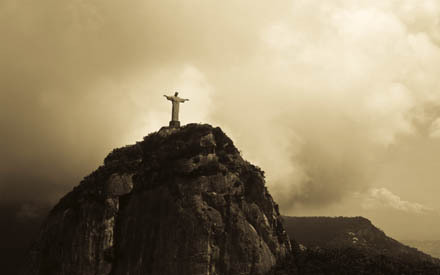 It took 10 years, but on October 12, 1931, the Cristo Redentor (Christ the Redeemer) was unveiled. The sleek, modern figure rises more than 30 meters (100 feet) from a 6-meter (20-foot) pedestal and weighs 700 tons. In the evening a powerful lighting system transforms it into a dramatic icon able to be seen from most areas in the city. 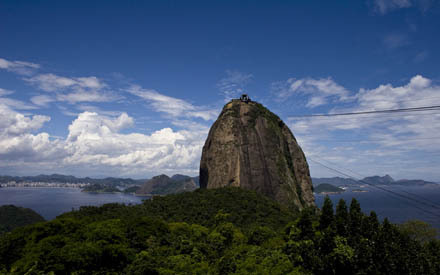 knowing we were on a tight time schedule and after a small terrifying trip in another taxi, we made it to Sugarloaf (Pão d’Açucar) as it is locally known. This soaring 1,300-ft granite block stands at the mouth of Guanabara Bay framed by beaches, the most famous of which is Copacabana. 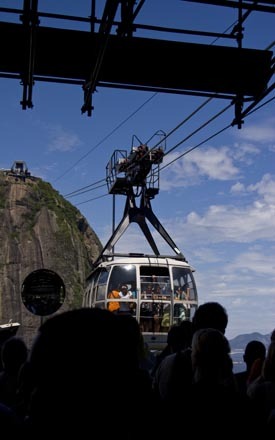 At the cable car entrance and after paying ($30 Real) each we were let into the Italian-made gondola’s, bubble like cars holding 75 passengers each which move up the mountain in two stages, the first stopping at the Morro da Urca, a smaller mountain in front of Sugarloaf, and the second continuing on to the summit, to a fantastic view of Rio, weather permitting, each stage taking around three minutes. It is simply stunning to be standing there drinking in the fact that you are staring at one of the most fascinating and most popular destinations in the world. Soaking in as much as we could as there are many places of interest each with its own spectacular view. Once again knowing we were on a tight schedule, and after a quick photo shoot with all of my friends we headed of to another icon. Copacabana beach, while walking around the promenade were we were able to see all the fascinating people who make the beach scene in Rio so popular. There are the beach tanned females, and soccer playing males strutting around, as well as the favela (poor) kids playing hacky sack, as well as the capirinhas sellers (Brazils national cocktail) every type of fruit sellers and even bikini sellers in case you forgot your own. There are even hotels and places to stay if you need one, somewhere to suit each budget. After a full day spent looking around the city and out of time, we headed back to the ship. Please understand I have only gone into a small percentage of the things you are able to see and do. There are so many other places, samba’s and people and flavors to experience while in Rio and having been there many times I have been lucky to eat, drink and experience most of these due mainly to my life on ships. One of the other times I was in Rio I took a helicopter trip over the city (O.M.G Wow) if you are short on time and wish to experience most of the sights in one go, this is one of the best ways to see this massive city and if you have a few extra dollars as it was not cheap. 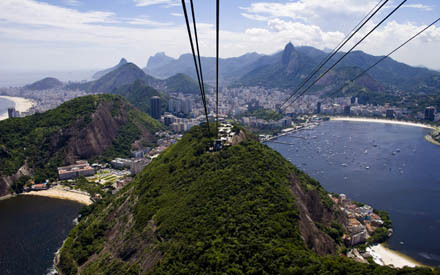 Although it was another fantastic way to see Rio, we flew around Christ the Redeemer then off to the beaches, Copacabana, Leme and Ipanema and a quick whirl around the city. Then I asked to go back to Corcovado to get some more shots of the statue, when we landed we had only taken up forty minutes of our day and so we went to the base of Sugarloaf to one of the many churrascaria restaurants this one overlooking Leme beach they have a buffet with seafood and salads as well as lots and lots of sizzling meat dishes brought to your table, until you turn over the coaster that’s on your table stating that you are too full to eat anymore, green for more and red for enough.Then we went out for coffee in one of the small cafe’s near Ipanema beach. We sauntered around Ipanema beach checking out all the beach life that goes with it as well as some of the boutique shops the area boasts. Then back to the ship as always and off to the next port. So on we go! 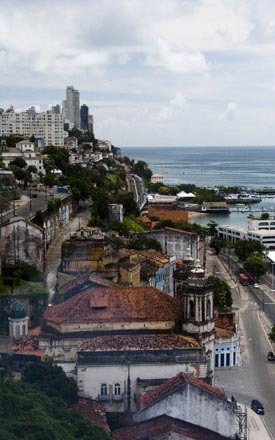 We sailed into Salvador it’s a small town on the coast in Brazil. The upper city which was reachable for those on foot by the elevator,which you took to the main part of town up a cliff around 500ft straight up costing you less than 25 cents for each person. There are two big lifts taking around 20 to 30 people each and they are nearly always full with a lift operator in each. 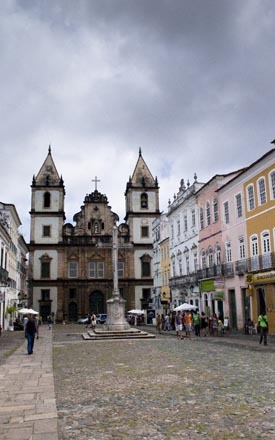 When you get to the top you are confronted with the main square where you will find some of the churches and cafes and shops, this is where most of the tourist go as it feels the safest while you are in Salvador. With a little walking we found a money changers, cambia,or cambio, depending where you are, (cambia means change) luckily it was right next to a great little coffee shop in one of the town squares overlooked by guess what, another church, so we just sat in the sun enjoying coffee and watching the world go by. When we were walking back to the ship and as we got close to the dockside markets we saw the police screaming and pointing guns at a group of youths across the road everybody was standing with their hands in the air while the police crossed over the road then while one police man covered them while the other searched them for weapons, I was pretty freaked out with how candid they were about weapons there and how quickly the police jumped on this group of youths that did not seem to be doing anything wrong, although I quickly shrugged that off as paranoia in a different country that I really knew very little about and overall I was glad they were not pointing the guns at me or my friends. So we set off once more on our way back towards the ship. 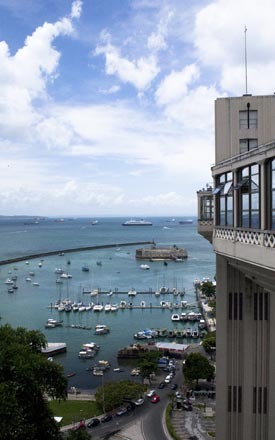 Where we headed towards our next port Rio.